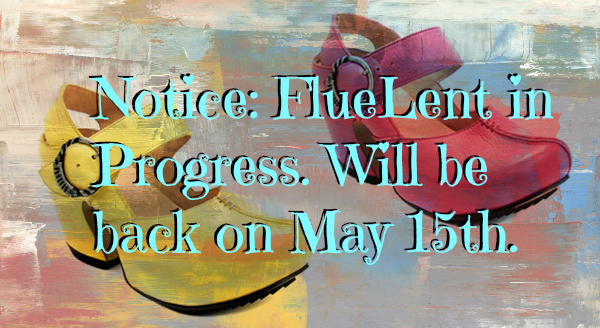 FlueLent: A time of Fluevog fasting, where one prepares for future investments in the greatest shoes around. A period of reflection and enjoyment of one’s current collection, without the distraction of new additions. A short break from Fluevog buying, where one takes the necessary time needed to construct a solid Flue-nancial plan for future purchases. A moment of rest, rejuvenation, and an opportunity for one to give her/his wallet/bank account/credit card a break. Confession: I’ve been a bad girl lately – but for good reason. Recently, I purchased what I believe to be the mecca of all vintage Vog finds: the Borden in red! They’re my dream Wonder Woman shoes. I scored a fantastic deal. They’re red. They have the heart heels. What more could the Generalissima want? (Um, more cash to purchase more Vogs!) With this recent purchase, I have decided that I need to maintain some control with respect to my collection. It’s growing a little faster than I’d like. I’d like to sell a few pairs, and I really want to enjoy the Vogs I have now. This is why I’m currently declaring myself on FlueLent (see definition above). Yup. You read that right. No new Fluevogs for me until May 15th, International Fluevog Day. With the new spring line coming out in the upcoming weeks, it’s safe to say that this fast will be tough. However, I’m going to leave my Fluevog future up to the heavens above. If I’m meant to have a particular Vog, it will be there when my FlueLent is over. Categories: FluevAlabras, Life | Permalink. I hear that. Oh my. The terrible decisions we Flueddicts must face…. i’m staying away from ebay. that’s the only way i can do this! after the yellow suede cbc’s that squeaked in right before you posted this, i’m seriously tapped OUT.